Reading and share top 13 famous quotes and sayings about Achieve Your Dreams by famous authors and people. Browse top 13 famous quotes and sayings about Achieve Your Dreams by most favorite authors. 1. "It's better to dare to dream big and achieve half of your dreams than to dream small dreams and achieve all"
2. "Believe in the magic that's in you, its potential, what it can achieve. But most of all believe in yourself and create a world where dreams become reality." 3. "Push to achieve your dreams. Don't let anyone push you out of dreamland." 4. "The size of your dreams must always exceed your current capacity to achieve them. If your dreams do not scare you, they are not big enough." 5. "..all I left with was the magnitude of my mistake, of my missing you. 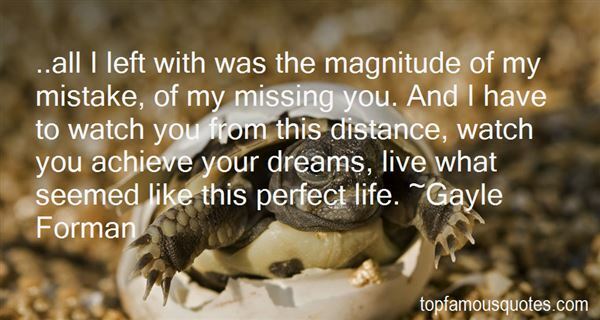 And I have to watch you from this distance, watch you achieve your dreams, live what seemed like this perfect life." 6. "Stop blaming people for not making you to achieve your dreams. The question is "are they the people having those dreams?" 7. "The more we delve into quantum mechanics the stranger the world becomes; appreciating this strangeness of the world, whilst still operating in that which you now consider reality, will be the foundation for shifting the current trajectory of your life from ordinary to extraordinary. It is the Tao of mixing this cosmic weirdness with the practical and physical, which will allow you to move, moment by moment, through parallel worlds to achieve your dreams." 8. "Be Your Own Biggest Cheerleader The world can sometimes be a harsh and cruel place. Everyone has their own opinions on different things and some of them will have no problem voicing what they think about your dreams. I really wish everyone can have their own group of supporters who will encourage them and cheer them on, but that's hardly the case. For many, the reality is they just have to be their own biggest cheerleader. Your opinion is what really counts. You can have tons of people tell you that you can achieve your dreams but if you personally don't believe it, you're not going to put in the effort to make your dreams happen. If you have tons of people hating on you and discouraging you, does it make things harder? Of course it does! But if you allow other people's opinion of you to negatively affect the belief you have in yourself, then you're just letting them win without even putting up a fight." 9. "Easy is not an option! Everything is hard! We get negative and give up! dont give up! you have a dream you protect it and cherish it, You find it achieve it and stare failure in the face and show them why you can! Happiness, and the feel good things of life are all fun and games but its never the things that make the person you want to be! The person you want to be is only in your mind and never leaves! Most of you are afraid to show it or share it or afraid of losing a friend because you chose to be something different! What about you? what about your dreams and your goals? where do you stand in your own life? we lose concious of the fact that we actually matter, Think of your own well being for once, goals or no goals still no matter what be yourself!https://www.facebook.com/CreatingNewL..."
10. "It's not about how to achieve your dreams, it's about how to lead your life, ... 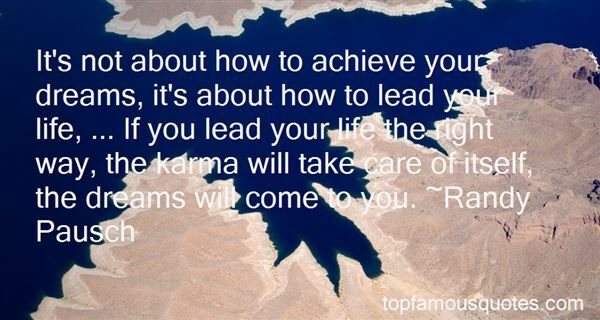 If you lead your life the right way, the karma will take care of itself, the dreams will come to you." 11. "Circumstances, knowledge or birth do not determine the realisation of your desires. It is only you who are blocking the achievement of your dreams and goals." 12. "Each of us has immense potential to achieve what we desire, unless you enliven and enlighten your life with inspiration, bring your dreams into reality through the power of desire you will never shine as bright as your potential." 13. "? To my daughter Taliah, I just wanted to tell you how proud we are all of you and all the other children of the PS22 Chorus of Staten Island. With your great determination and hard work you all made this day happen, singing at the presidential inauguration. I want you to remember this day for the rest of your life, because it is such an historical day for you, for your school and for our nation. As you sit above the great man below you taking the oath of presidency...remember as a child he had dreams too and the great odds he had to overcome to achieve them . May your dreams take you far in your life and may it all start on this day, at this period of time, at this historical moment in your lives...may you all cherish this moment in your hearts forever!" I saw Jonathan after he faced the fear demon, you know. It showed itself to him as you. That told me all I needed to know. The greatest fear in Jonathan's life is the love he feels for his sister."